Digitalization opens up the opportunity for real innovation – enabling your business to move at light speed, and reduce risk. An extreme customer-focus, rapid test-driven development, and a data-driven mindset are all incredibly useful capabilities to bring in-house. The app enabled the bundling of digital applications & services in the metal industry. 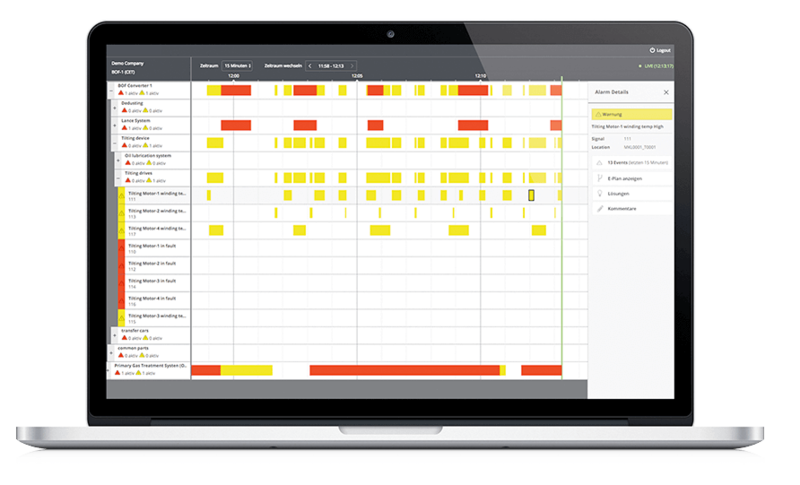 The app visualizes any alerts received from plant systems in a clearly structured overview – and helps staff to quickly determine the cause of the fault, and rectify it by providing alert-specific information and documentation. A Data Lab was formed to lead future machine learning projects – and achieved an early win, improving the ability to predict/prevent surface cracks. Identifying the customer’s pain points. Empathy phase, initial ideation and the development of several prototypes. Prototyping of the relevant product ideas and positive user validation. Launch of the digital platform and the app. Ongoing user-oriented development & enhancements. The new digital unit in became self-sufficcient in June 2017.
International company in the area of mechanical and plant engineering, specializing in the processing of steel and non-ferrous metals, with approx. 14,000 employees at over 80 locations. In 2015, the group generated sales of more than 3.3 billion.